Gunwoo Han W10803718 CSCI 7 (CRN:30444) Professor Desmond K.H. Chun Lab Assignment 1 1. Variable: A variable is a symbol or name that stands for a certain value, such as numbers, or words. Example) A=10, B=Apple 2. For loop: For loop is a type of loops in python. For loop repeats statement for certain number of time. 3. While loop: While loop is a type of loops in python that repeats statement indefinitely if a certain condition is true. If certain condition is false, the loop stops executing. 4. Array: Array is the one of the fundamental data structures in any language. But in python, ‘list’ is used instead of ‘array’ since python does not have native array data structure. 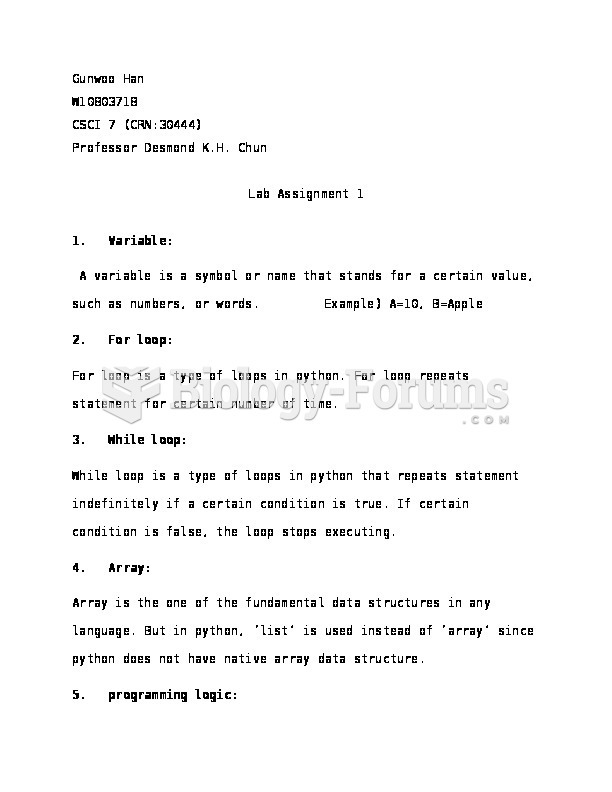 5.	programming logic: Programming logic is to create an application that can allows the computer to understand the operation so that the computer can perform a task. 6. Assignment statement: Assignment statement creates new variables and give them values. The assignment statement links the name with the values. 7.	compiler: Compiler is a program that translates source code made by human into machine code that allows the computer to execute. 8. Comment: Comment is a text note that can be attached to the source code. It is used to provide explanation about the code so that your peer developer can use it to maintain or enhance your code. 9. Boolean: Boolean is a data type that only have two values: True or False. 10. Data types: Data types are type of data. Data type is a data storage that contain a specific type of values. Those data types are, such as integers, strings, characters, and Boolean. 11. Main memory: Main memory is also called RAM, or Random Access Memory. It is like a working area for computer. It stores data temporarily and work with information at the same time. 12. Flow chart: Flow chart shows the sequence of steps and decisions for a process using visual representation. Each steps are surrounded by specific diagram shape and linked by lines and arrows. 13. Central Processing Unit: Central Processing Unit, or CPU is like a brain of the computer. It performs all the instructions of a computer program. 14. Operating system: Operating system manages all the software and hardware on the computer. It manages computer’s memory and processes. Type of OS are: Microsoft Windows, Mac OS. 15. Byte: Byte is a unit of data that is used to measure amount of information stored in a computer’s memory.